It’s a texture thing and even writing this down has me pulling faces. So I didn’t jump for joy when some delicate little green claws of okra, fresh and slightly furry, arrived in my Bumble Box veg box. This was a challenge. ‘Cook it for a long time and all the sliminess goes.’ Hmmm, I’ve heard this one before – so how come when I’ve tasted it in an Asian curry it’s shiver-makingly glue-some? ‘Pan fry with some spices.’ This was sounding more like it. And the best one (Eat, Write, Think) ‘Indians love okra and no one ever complains of it being slimy… it’s the way it is a very karmic way of thinking.’ I LOVE this suggestion but I’m too impatient for meditation! I turned to a recipe by a writer who sounded like she had as deep-seated an aversion to this loathsome veg as I do – Tamasin Day Lewis. Her recipe coats shreds of them in spices and gram flour and deep fries the mucus into oblivion. Did it work? Yes – no slime at all. Were they nice? Well you know that addictive thing about deep-fried stuff? You take a morsel and think ‘hmmm, that’s ok’ and then another and another. The multi-layered spices mean you may get a taste of ginger, or the sweetness of some onion and you are left with a slightly salty, warm taste. I might add a finely sliced chilli next time (wow, I’m thinking about next time!) These make a very nice nibble with drinks (like cassava chips are) or a crispy garnish for soup or even a vegetable crouton-like sprinkle over salads. Cut the okra, onions and peppers into thin strips (julienne). Add the dry spices, ginger, chickpea flour and corn flour, and mix well to coat. Use a deep fat fryer or fill a pan one-third full with vegetable oil. Heat the oil, and test that it is hot enough by dropping a bit of the mixture in. If it fizzes and starts to brown immediately, carefully add some of the vegetables. Do not add all at once or the pan could bubble over. Fry, in batches if necessary, until crisp and brown all over. Drain on kitchen towel. Sprinkle with the finely chopped coriander. Serve. 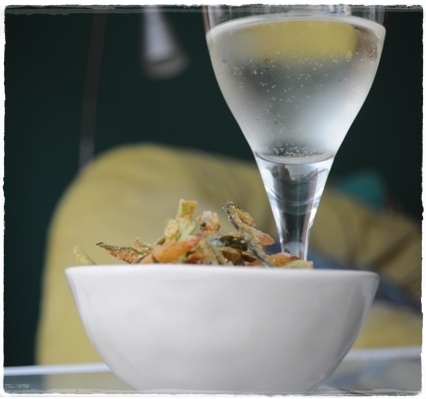 I bet this is the only okra recipe sent to Fabulicious Food for her fab seasonal round-up of recipes. Do you have a non-slimy okra recipe that you’d like to share? 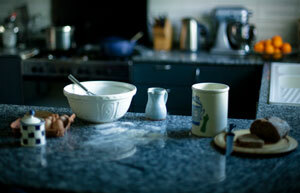 And what’s top of your food aversions? 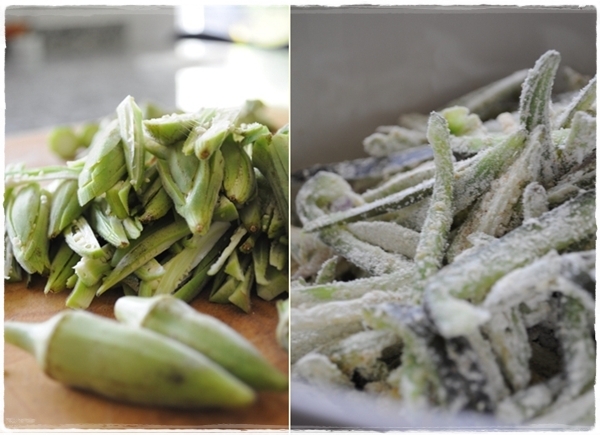 I adore okra, but can’t seem to get my tribe to eat it at all…might have to try your deepfrying method! Top of my list (and one of the few items) on my foods to be avoided is okra. Good for you for giving it a shot. I still have not. But I do like tripe (in small batches) as made by Italians and Spaniards. hahaha….did you do that little cartoon thing up top yourself? I love it! We actually make crispy deep fried okra with spices at home all the time, though without the gram flour. Everything else, including onions, etc. all pretty much the same so I know how yummy and addictive this can be (in fact I have a tub of it in my fridge right now!) Our favorite pairing for it is with warm mango/tamarind-flavored yellow daal, the tanginess pairs with the fried okra so well. Glad you found something that helped you get over slimy okra-phobia! With daal is a great idea. The cartoon is my very inexpert use of Gimp and Photoscape doctoring a children’s book cover by Lauren Child. Lola, the character in the book, has a deep seated aversion to tomatoes! Ugh. Okra never once got me excited either. The Lola sketch is HILARIOUS! Love your sense of humor. Using words like mucus causes the gag reflext to kick in. Nasty. Hmmm… I’m averse to intestines, gristle too. And runny egg yolks used to make me gag as a kid, but I’m over it now. Broccoli is actually on my list of things I hate. Life is too short. I grew up eating okra (although my family called it Bamia) and really enjoy it. 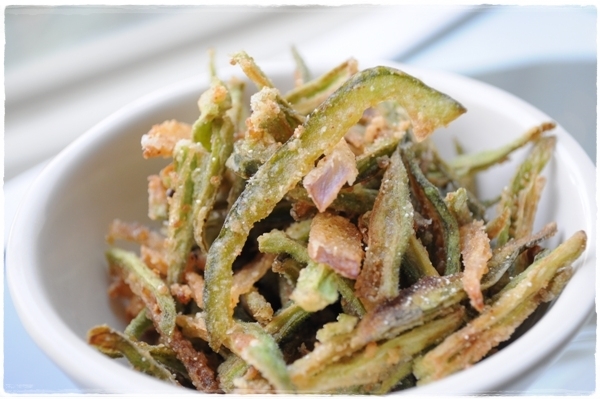 Crisp okra looks so tempting! I’ll have to give this a try one day. Love the post (and the cartoon-touch). 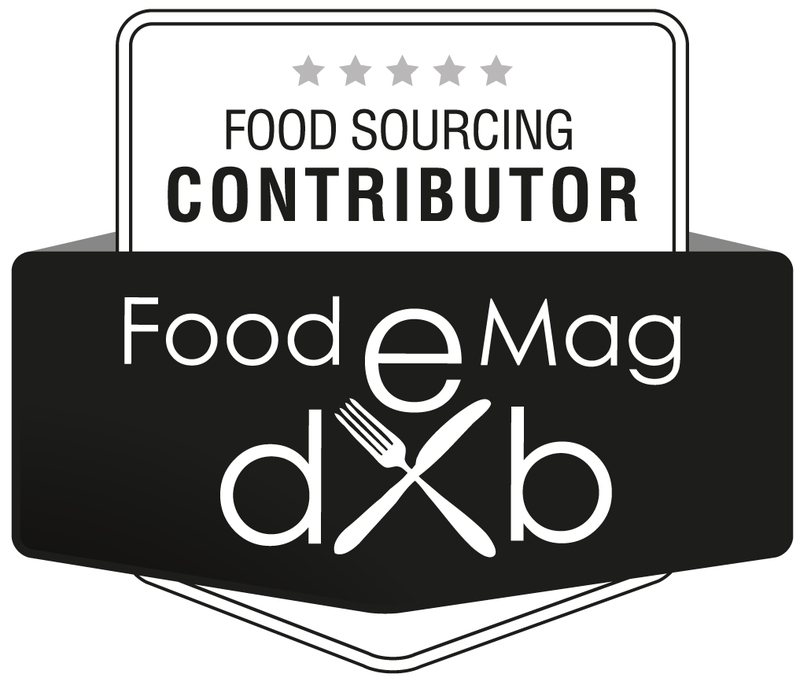 I’d love the mango daal recipe – I have some mangos that need to be eaten or they are soon-to-be-bokashi!! Yes I fancy that mango daal recipe. Will have to twist I live in a Frying Pan’s arm! Bravo! 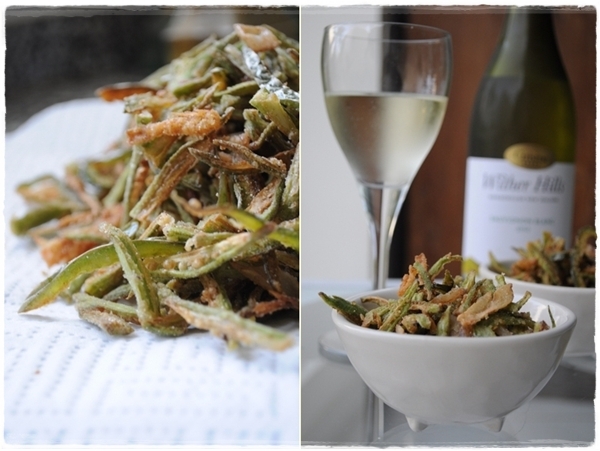 That was a masterful stroke to deep fry the okra…and even more masterful to have some wine with it! As you know, deep frying and wine makes anything better. Do you know, I’ve never even tried it! Never been offered it either. Everything is good crispy and fried though eh? I can’t believe you just said that – with you totally on the corn strach, thickener gloop though. I LOVE okra and always order it when at an Indian restaurant. Nearly everything is good deep fried and crispy. Love the Charlie & Lola picture. Nothing, nothing, nothing can ever make me eat bhindi (or okra) willingly. No matter how it’s cooked. No matter how masked the taste is. I can find it. And I mean, we make bhindi dishes in my house frequently, and there’s no slime, but I just cannot stand the taste in general. So foods I avoid? Bhindi, cauliflower, cabbages, brinjals, prawns, . Yes, I’m fussy with veg food. I’m quite a carnivore! 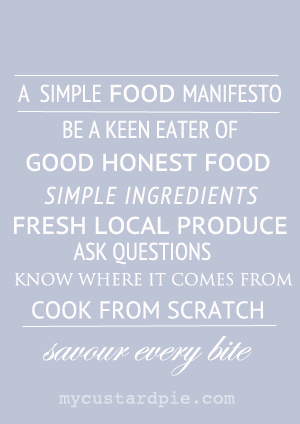 …and you list some of my favourites there! 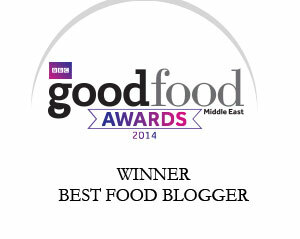 Cabbage is a the most delicious vegetable and a good cauliflower cheese is sublime. Good thing we’re not all the same! 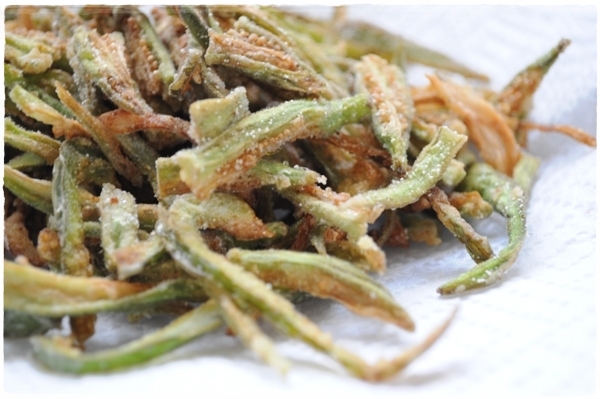 I think your crispy fried okra look a treat, a perfect crunchy vegetable dish. …I have to admit there may be a next time Laura so thanks for your advice. Look forward to the round up Ren.